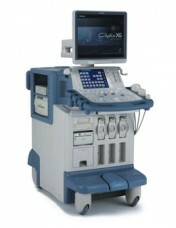 Doppler or duplex ultrasound scanning is a form of ultrasound scanning used to examine arteries and veins and is often performed before some of the interventional radiology procedures like angioplasty and stenting described in the Peripheral Arterial Disease and Carotid Intervention sections. The radiologist scans the vessel using a small hand-held probe placed on the skin surface using a water based gel as a contact agent. The images are displayed on a monitor and detailed measurements of the vessel and rate of flow of the blood within it can be made to assess any narrowing or blockage present. Dr. Crowe can offer ultrasound scanning at all locations listed. For further information or to make an appointment please use the contact form or speak to Dr. Crowe’s secretary on 0121 448 1502.